Guess what? 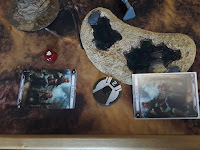 I got a game in against my buddy Kasey with the new Battle Cards from Priority Supplies. A combination of random luck and careful selection wound up with these cards for the game. We're getting our games in at Drawbridge Games - my local gaming store - where we're winding up a month long custom League. 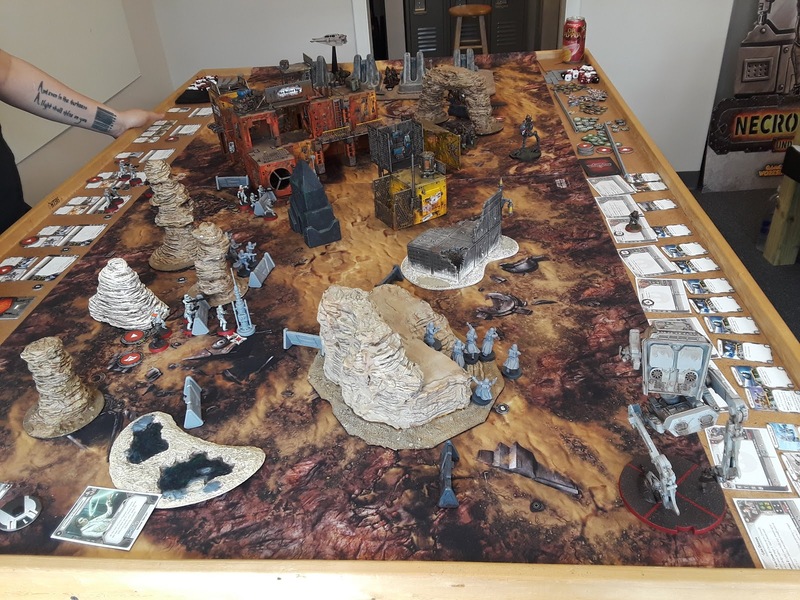 "Operation Wampa Brunch"
Operational Objective: Destroy 2 Trooper Units (easy enough, right?) in a single game. off one of the mines. It all started with objectives. Kasey had a better bid than me, and chose to play Blue Player. 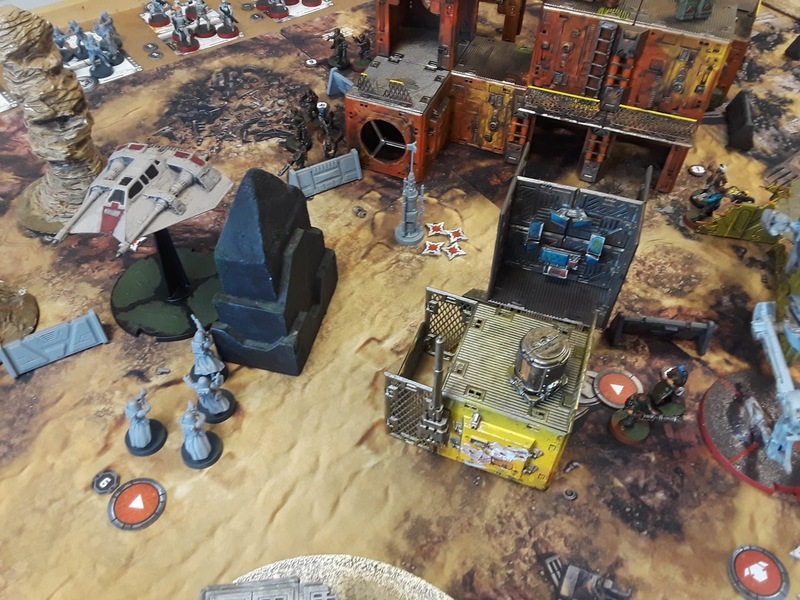 Because of how the deployment zone was set up, I put my objectives far back towards my short side in a place where I could pick them up while moving my units forward. Kasey put one of hers back near her short side, and a second further up in the hopes that she could rush for it and settle into defensive positions before I could get close. Also as she told me afterwords "It's boring if you don't have objectives closer to the enemy." I can't really argue with that. 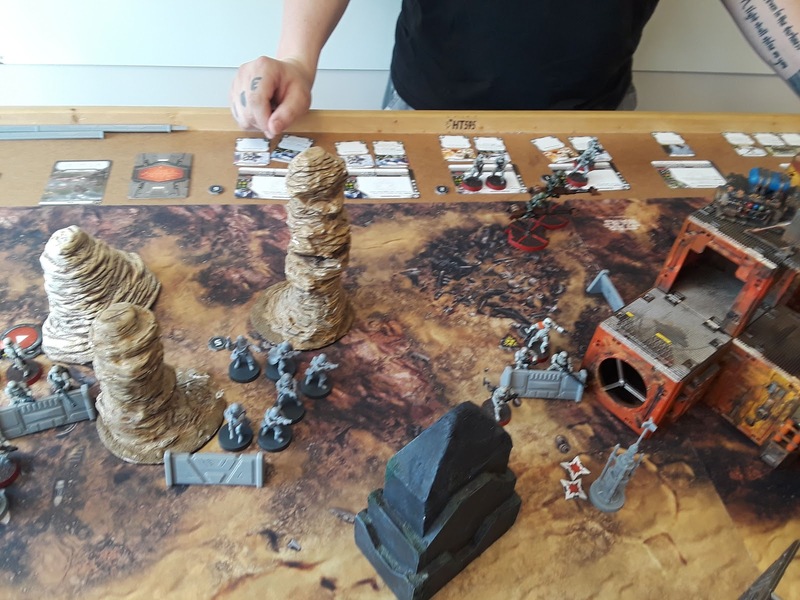 Mines were placed on the approach to Kasey's objective from my side of the board, on top of both of Kasey's objectives, and on one of my objectives. 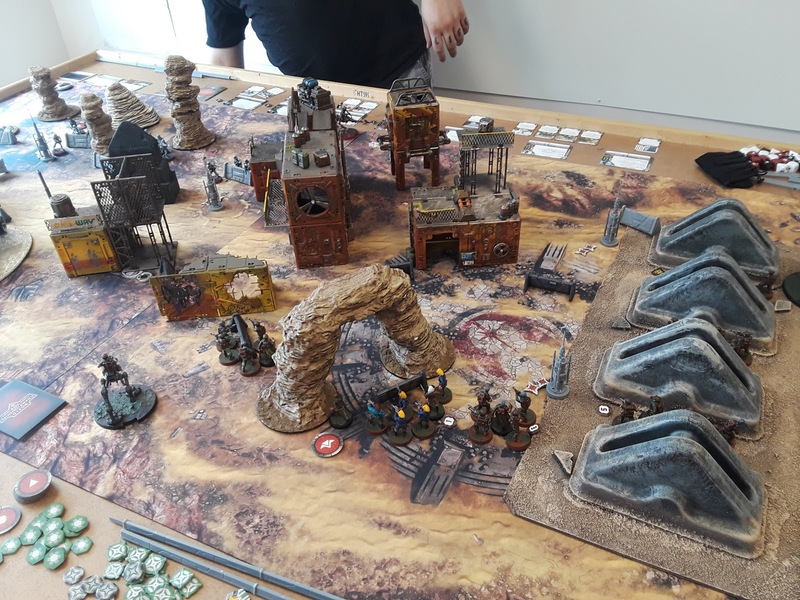 Scout 1 was interesting as it let our troopers push forward from the sides of the map towards cover and the objectives. Kasey had run some of her Stormtroopers forward to contest the objectives, while mine pushed out from my corner towards the "town" in the middle. 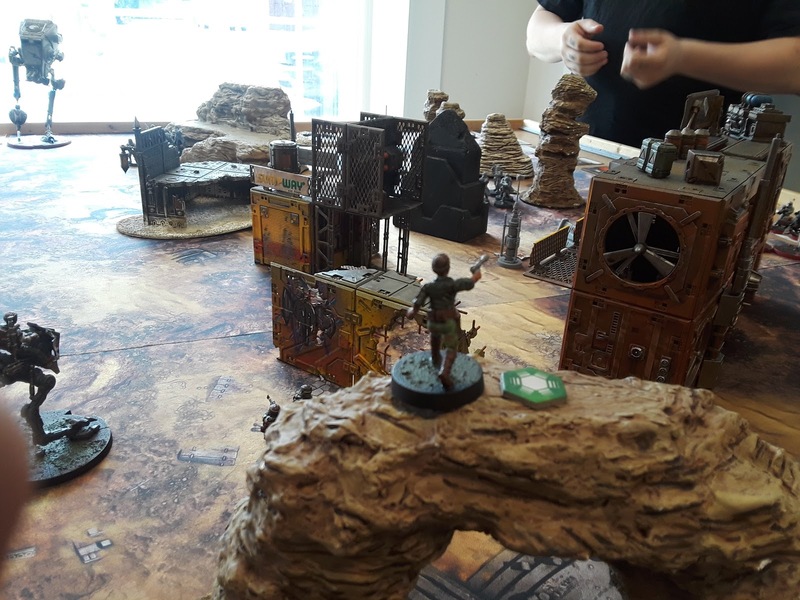 We had agreed when starting that the town would give trooper units light cover as area terrain. 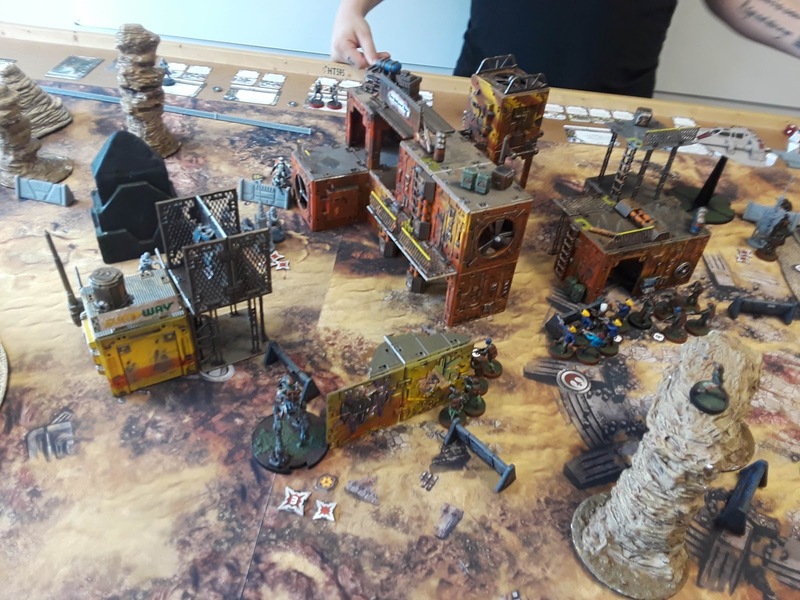 Actually, all total we set off 3 of the 4 mines during setup alone, running a single unit of troopers into each one set up next to an objective. 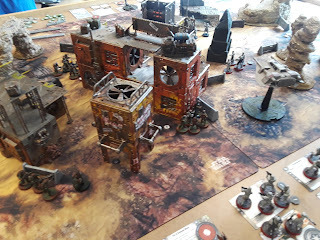 Kasey got the worse for wear, hitting a double detonation on the one near the farthest bomb, losing 2 Stormtroopers and suffering 2 suppression. I started off with a Coordinated Bombardment, while Kasey probably assumed I would either try for "No Time For Sorrows" - my usual Leia opener - or Assault. I assigned an order token to Leia, while Kasey assigned her tokens to Veers and the farthest back Stormtrooper unit. Kasey's AT-ST would hold the right flank of her board. 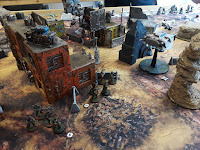 Speederbikes prepared to flank the Rebel positions from the left, disrupting their approach. My Airspeeder was able to deploy last, and set up to come around from behind the "generators" on a delayed approach. It would have to tangle with the Speederbikes. Leia climbs to the top with Grappling Hooks, giving her a great view of the battle. I opened with Leia, who immediately climbed to the top of a nearby rock formation to scout the battle. She then was able to call down her bombardment on multiple Imperial units. 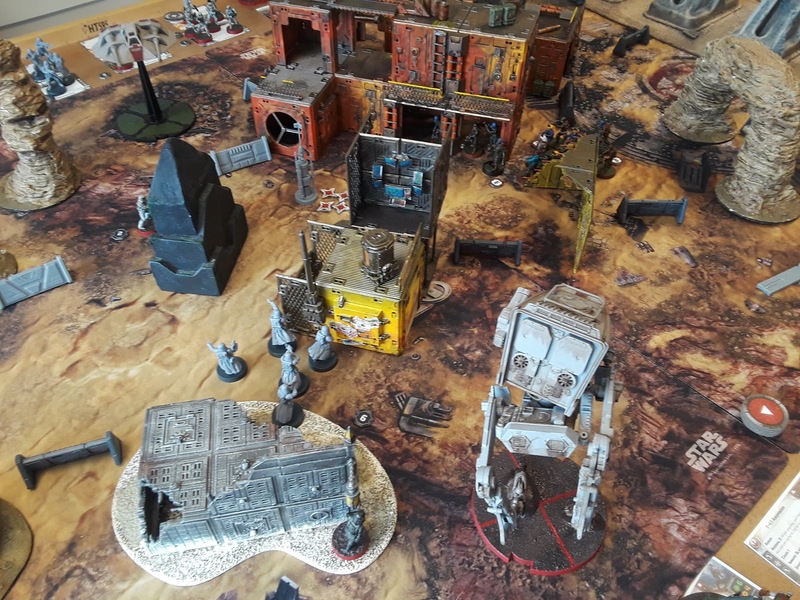 I ignored the AT-ST at this time, favoring hitting Snowtroopers (to slow them down, with any luck) and the already weakened Stormtrooper unit that had set off the mines near the middle objective. 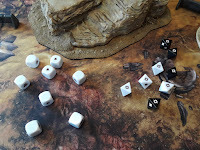 The AT-ST lobbed mortar fire and moved forward, and my AT-RT moved up to set off the final mine and shot at the Stormtroopers near the close objective. 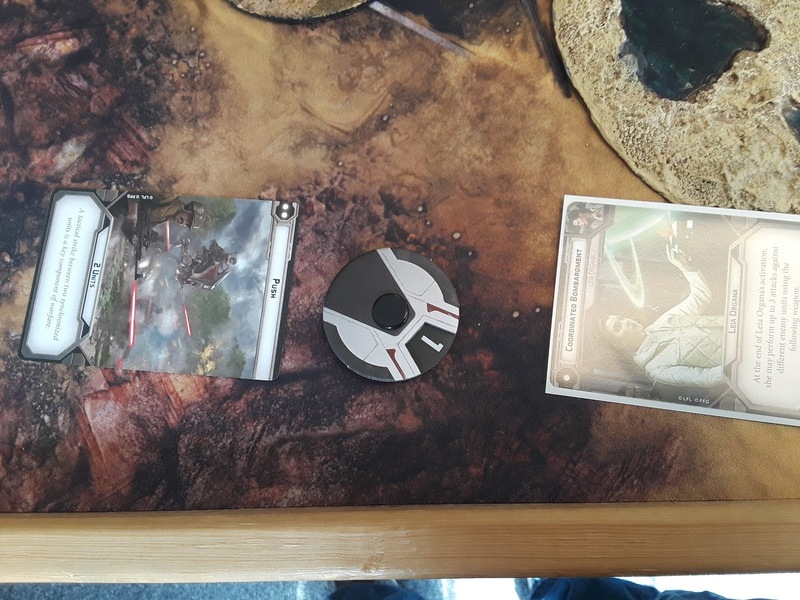 I got lucky with my Airspeeder, drawing its token late after the Speeder Bikes had to commit. 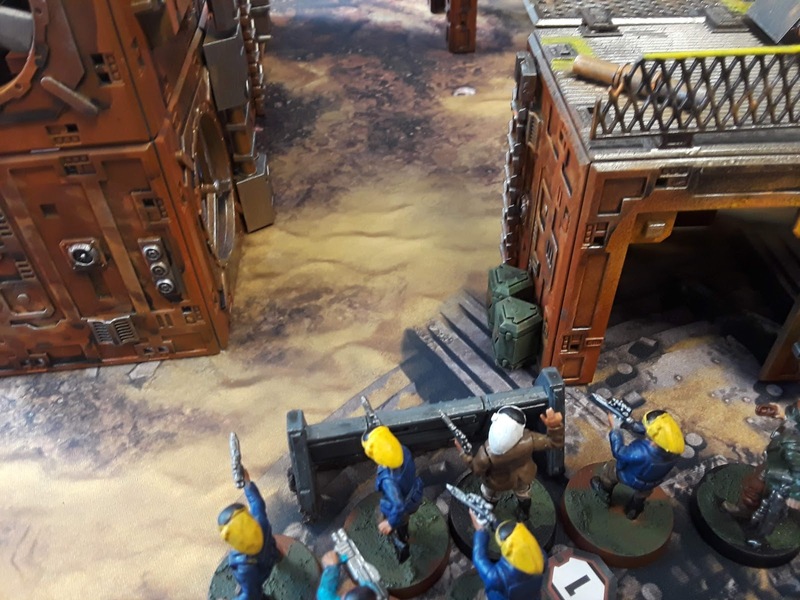 They moved into the alley between the buildings, but the rear Bike had stuck out enough to get a quick parting shot at them with the Airspeeder. Kasey wins the roll off after I fail to get a block. Round 2 would start with an ambush! Unfortunately my ambush was quite a bit less effective than Kasey's. She started by opening up on my AT-RT, hitting it with her Stormtroopers well enough to Damage it. 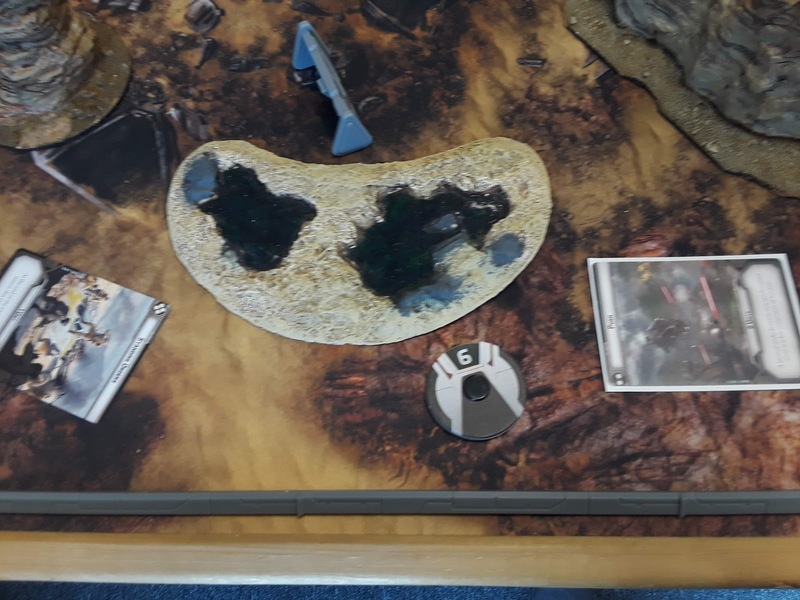 Fortunately for me, this let me do what my Ambush plan was in the first place and activate the 198th Squad 1 Fleet Troopers and delete her Speeder Bikes from the board. Fleet Troopers are really, really good at getting rid of things you don't want to see get any closer to you. 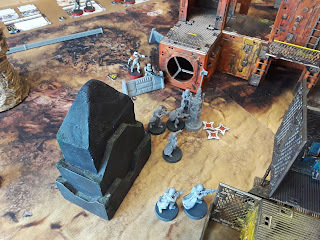 Snowtroopers moved forward to contest the objective and put covering fire down at the trooper units I would need to send through the chokepoint between the buildings. 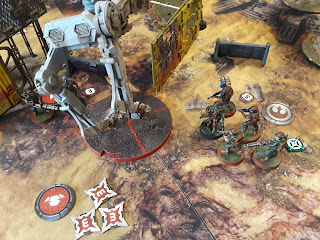 My AT-RT would soon be wrecked by the AT-ST before I would be able to use him again. Meanwhile, my troopers raced to get into position after repairing their vaporators. I assumed at this point that it would be very difficult for me to win priority, so I focused on mitigating that. 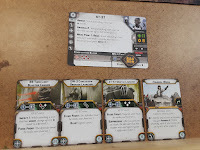 The best card to do that is "Somebody Has to Save Our Skins" which lets you double activate Leia and someone else. So while Kasey would get the first activation, I would gain tempo against her in the next activation. 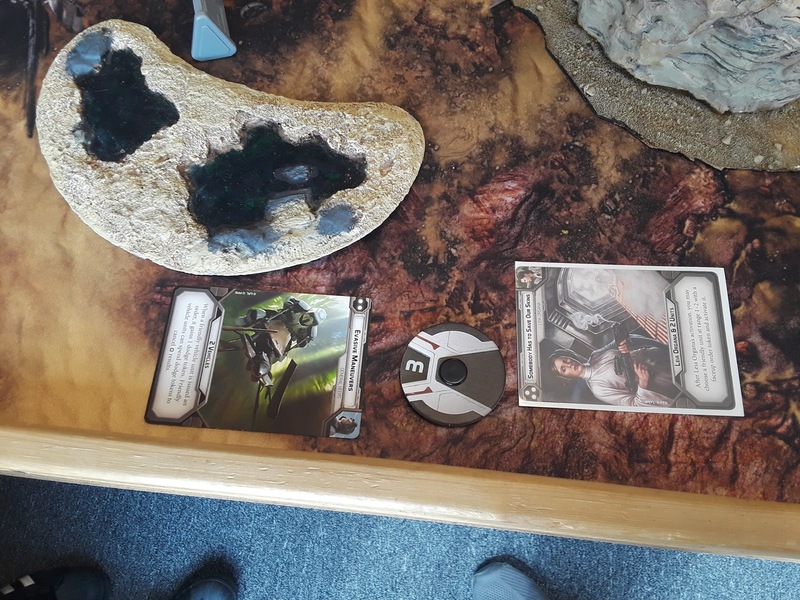 I missed getting pictures of this, but I was able to assign Leia and Fleet Troopers my tokens, as well as the soon to be very dead MPL squad, who would be the focus of pretty much everything the Imperials could throw at them. This round is sadly missing pictures. 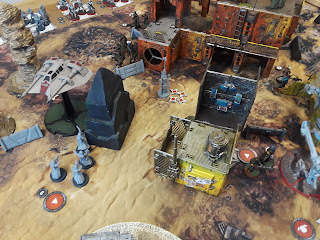 It mostly involved a firefight in the center of the board for Kasey's forward objective, as well as the Airspeeder finally moving forward to begin turning up the Right Flank. 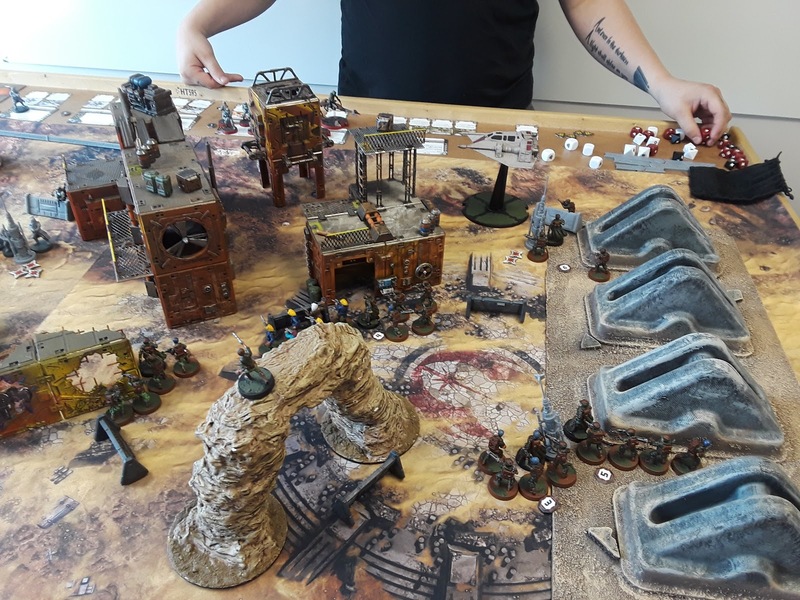 Two units of Rebel Troopers (Blue and Purple Squads) followed it up the right from behind the town, while the rest of my troopers funneled through the bottle neck and stared down an AT-ST, which was getting awfully close. 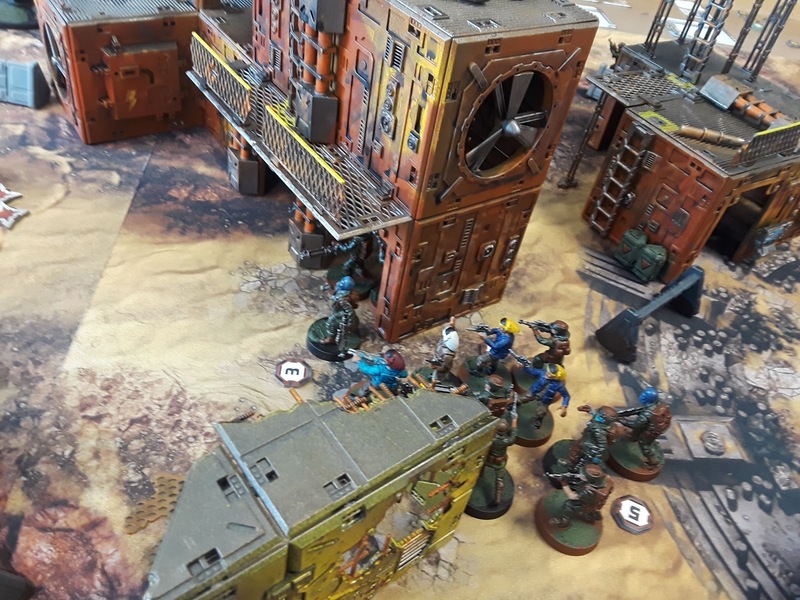 Blue Squad - my MPL troopers - died without being able to ever shoot their Ion cannon, though they had pushed as far forward as the town center before being focused down. 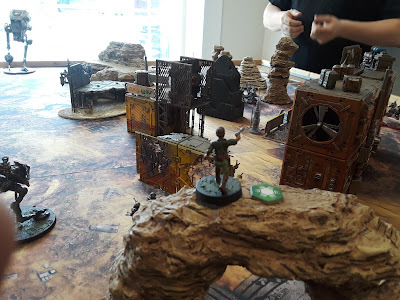 I saw Veers move into position for Round 4. It was obvious what was coming, so I threw Assault down. Veers was going to go first and light something up. The AT-RT continued to push forward with the Snowtroopers. 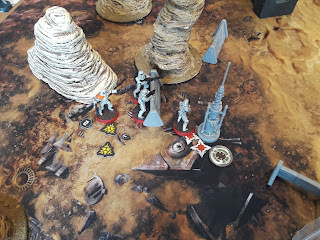 The Stormtroopers had mostly been eliminated by the Airspeeder and trailing Blue Squad. Most of my other troopers were stuck in the funnel. Even with no real troopers to content with, the AT-ST was in good position to shoot them. 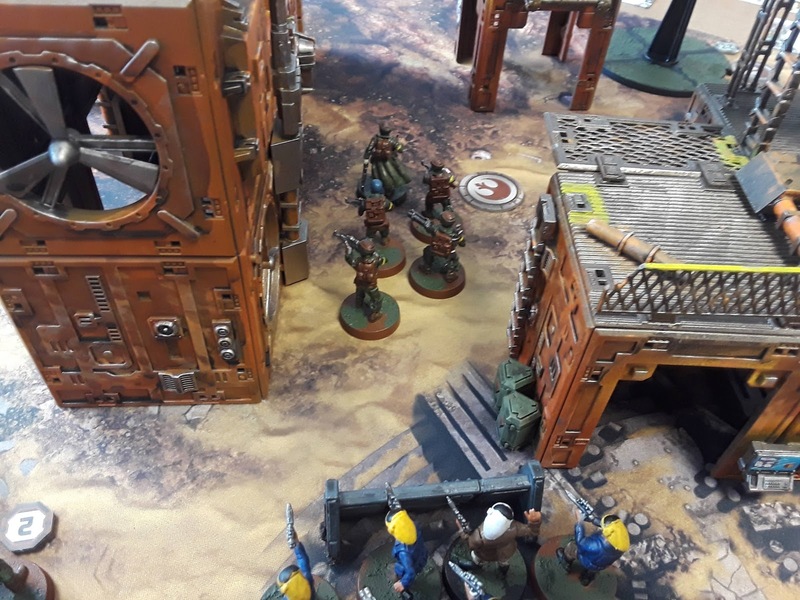 Duro Squad held the building in the middle of the map, while Leia, the 198th, and Red Squad slowly moved up. Blue Squad had gotten into position more quickly than Purple, who was still coming up through the city. The Airspeeder was ready to go. 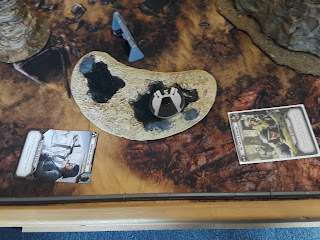 Most of Veers troopers were eliminated this round, and Veers attack against the Fleet Troopers did some damage, knocking them down to just a 3 unit squad. 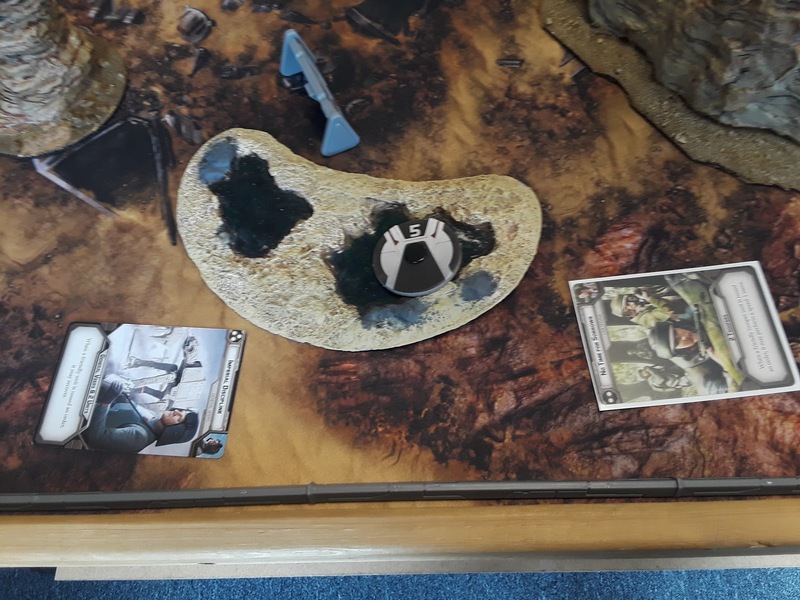 At this point it was mostly mop up, but the AT-ST was still on the board to cause havoc. 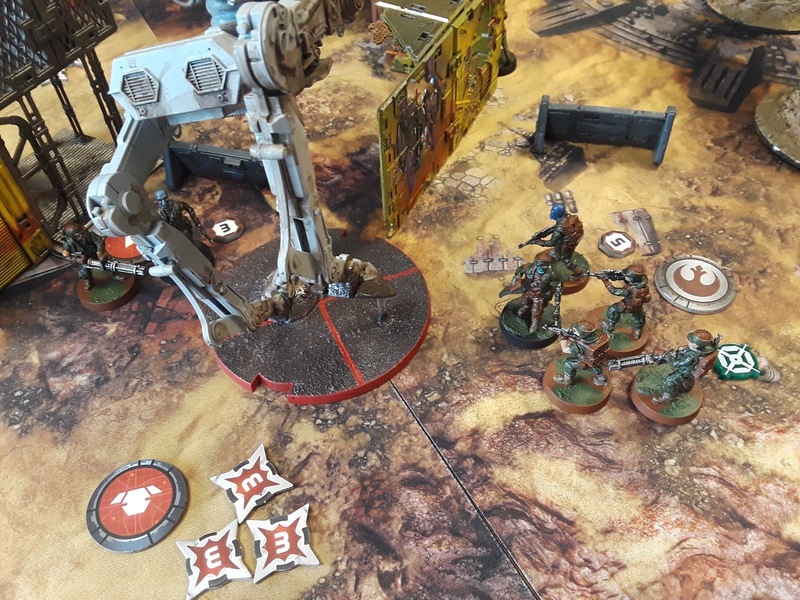 It eliminated seriously damaged Duro Squad, and pushed forward to get its guns on Leia. Weiss was used at this point, because Veers had one more trick up his sleeve. At this point I only had 2 pip cards, while Kasey had only 3 pip cards, so I could count on going first for the rest of the game. 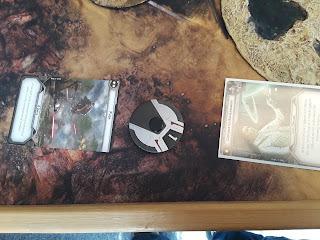 No Time For Sorrows was a huge play here, because of where the AT-ST was. I was able to take my remaining Rebel Trooper Squads (Duro and Red) and move them to either side of the AT-ST before it activated. Red Squad would go first, and put their Impact Grenades to good use. 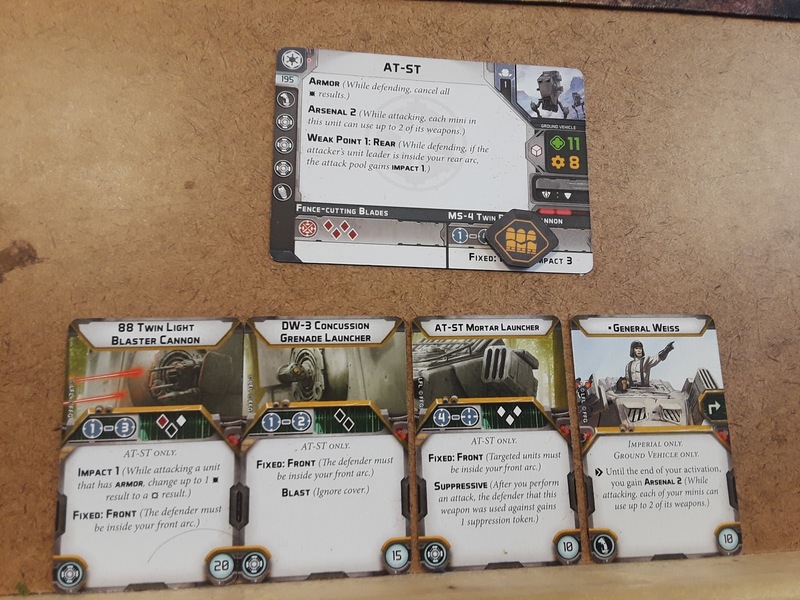 Impact 4 and some luck later, and that's 8 critical hits on the AT-ST. Block rolls were average, but I'll take 6 damage any day of the week. While this left the AT-ST with a damaged main cannon, and on its last legs, it was able to back up and utterly destroy Duro Squad. Operational Objective complete for Kasey. 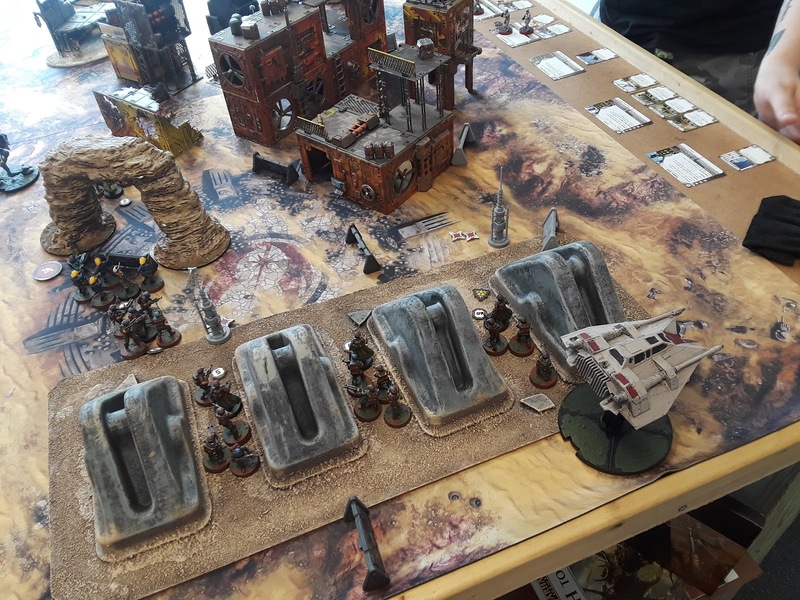 The Airspeeder was tasked with mop up duty, finishing off the wounded AT-ST. Blue and Purple squads pushed forward to finish off the Snowtroopers. We pretty much called it here. 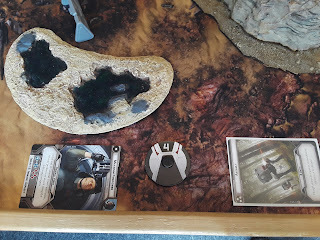 My first action was to order the 198th to run up to and repair the center vaporator, and Veers was all that was left on the board. Still, Operational Achievement for both players, and this was Kasey's 3rd game giving her an "Elite Prize". - Fleet Troopers are seriously really good. The Fleet Troopers pretty much cleared out 200 points of units by themselves. They are especially good at deleting Bikes. - My Ion Troopers pretty much existed as ablative armor for the Fleet Troopers as they got focused down instead. - Airspeeders can do good work if you follow them up with Infantry and hit a flank hard. Don't sent them down the center, and delay their push until turn 3 or 4. - 6 mini squads are nice, but Kasey could would have been better served with another 5 mini squad instead of maxing out the number of troopers in her existing squads. Also I'm not sure the Super AT-ST is the right call. Mortars are... okay but not great. Also, Range 2 seems to be the AT-ST sweet spot. Getting into Range 1 was what let my Troopers flank and grenade it to death. - If I was up against a Jedi, I would have had to go with the Kylo Ren School of Dealing With Jedi - "I want every gun to fire on that man." Fortunately that wasn't an issue. - Actually there was no melee that game. Just lasers and grenades. 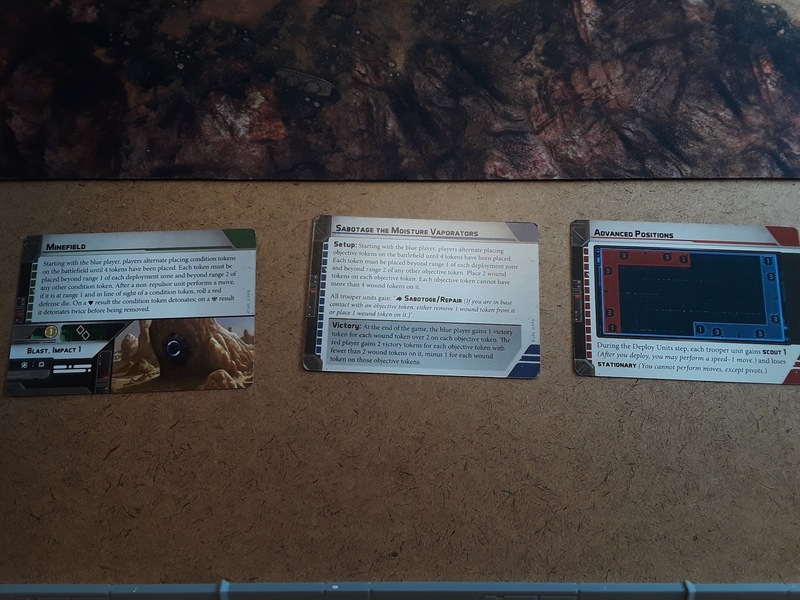 - Priority Supplies Battle Cards are interesting, but not game breakers. Mines are here to play, not to stay. Vaporators interestingly create a fight over the flanks, but not necessarily the center. And Advanced Positions is interesting, but didn't feel much different than Major Offensive. 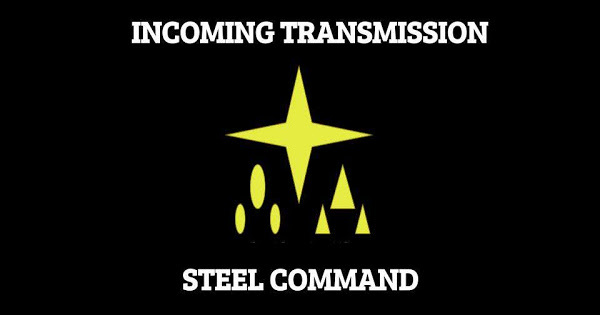 Still, good enough to drop Disarray (ugh), Limited Visibility (Leia list), and Intercept the Transmissions (ugh). Thanks for the game Kasey, a great opponent! Good luck in your last League game! Thanks for the write up! It makes for quite an entertaining read. I'm looking forward to playing more games with these new cards. I think the game could have been quite different if Veers had used Maximum Firepower on the T-47 in the first turn. He couldn't even if he wanted to. The T-47 was WAAAAAAAY in the back, behind LOS blocking terrain. Sounds like you have better terrain than me!